Status Change - In his 2010 Species Update, W. George Schmid examined the origins of the species, Hosta sieboldiana. The sports and hybrids of this species account for more different cultivars in home gardens than any other hosta. In his extensive study, Schmid concluded that the plant grown in our gardens as H. sieboldiana is actually a hybrid cultivar developed in Europe after it was imported there by von Siebold in 1862. Therefore, the proper name for this plant is H. ‘Sieboldiana’. Although this change has been officially adopted by The American Hosta Society, there seems to be a bit of disagreement concerning this change among some Hostaphiles. Bob Solberg of Green Hill Farm in North Carolina in The Hosta Journal (2018 Vol. 49 No 2) states that he and Mark Zilis of T&Z or Q&Z Nursery in Illinois on a recent trip to Japan found at least one example of the species form of H. 'Sieboldiana' growing in the wild. If you have a large size, bluish green, mound forming hosta, odds are that it has the species, H. 'Sieboldiana', somewhere in its background. Perhaps the classic of this type is H. 'Elegans' which has been around for around a century. The average size mound of this species will be about 24 inches high and over 60 inches wide at maturity. It will have near white flowers with a pale lavender mid-tepal stripe from late June into mid-July. The leaves are broadly ovate, with thick substance and are heavily corrugated. It emerges blue-green in the spring due to a waxy cover on the leaf. However, the wax may melt away as the summer progresses resulting in a green colored leaf by fall. According to The Hostapedia by Mark Zilis (2009) there is some confusion about the actual characteristics of this species. The true species forms that he has observed do not always match those of H. 'Elegans'. The true species types have less corrugation in the leaves, are not as blue and form clusters of flowers that are less dense than those of 'Elegans'. The Hostapedia by Mark Zilis (2009), states that "The true H. 'Sieboldiana' is uncommon in hosta collections and nurseries. Most plants with this label are actually green-leaved seedlings of H. 'Elegans' and are not the true species...I attempted to find H. 'Sieboldiana' in the wild or wild-collected specimens. No collector I encountered had ever seen it...Even veteran plant-hunters, who had found hundreds of other unusual hostas in the wild, had never seen it." W. George Schmid, author of The Genus Hosta (1991), wrote an article for The Hosta Journal (online version) in which he proposed that the plant that has been called a species, H. 'Sieboldiana', should probably be more correctly called a cultivar, H. 'Sieboldiana'. He made this statement under the premise that no "wild" population of the species is known. At the January 19, 2013 Hosta Scientific Meeting in Lisle, Illinois, Mark Zilis said that Japanese plant collectors believe that they have found plants of the species, H. 'Sieboldiana', in a remote part of one of the Japanese islands. He said that the discovery is yet to be scientifically confirmed but he hoped that a more definitive declaration would be coming in a year or two. The species is named for famed plant explorer, Philip von Siebold. "H. 'Cucullata'= H. 'Sieboldiana'" - Also, this may have been sold as Mackwoods No. 1 at one time. So, it sounds as if, when someone talks about a "Sieboldiana" type hosta, they are really talking about H. 'Elegans' and its many, many seedlings and sports. An article by W. George Schmid in The Hosta Journal (1985 Vol. 16) states that, "The other German hosta of great interest is H. 'Semperaurea'...it is the most magnificent golden-leaved hosta I have seen...said to have come from Japan in the 1930's, and, therefore, there would have existed a golden-margined form of H. 'Sieboldiana' -- which we now call H. 'Frances Williams' -- in Japan during that time. ...In England Heinz Klose obtained a number of H. x tardiana plants after Eric Smith left Hadspen House nursery. He is also actively selecting and propagating H. 'Semperaurea' seedlings...Named by him are several hybrid seedlings: H. 'Goldpfeil' ('Gold Arrow'), H. 'Weisse Glocke' ('White Bell'), and H. 'Zitronenfalter' ('Lemon Butterfly')...special cultivars with H. 'Sieboldiana' lines are: H. 'Blauglut' ('Blue Glow') and H. 'Blaue Wolke' ('Blue Cloud') which reminds one of H. 'Blue Heaven'...with his H. x tardiana...has named one H. 'Irische See' ('Irish Sea')...H. 'Nordatlantic' ('North Atlantic')..."
Note: Nomenclature changes recommended in the 1991 book The Genus Hosta by W. George Schmid and accepted by The American Hosta Society would update names as follows: H. x tardiana is now Tardiana Group. An article about H. 'Dorothy Benedict' by Herb Benedict in The Hosta Journal (1991 Vol. 22 No. 1) states that, "During 1990, the six best, 7 year old seedlings were named and three were registered. #1. 'Gil Jones' - A large upright H. 'Sieboldiana'-type, with blue-green leaves and a wide cream edge. #2. 'Jim Wilkins' - A low spreading reverse with a cream center and with a blue-green border on its leaves. #3 'Hideko Gowen' - A tall, upright reverse with a maple leaf cream center, a wide green edge and a thick cupped round leaf. #4 'Tom Boy' - A small, slow-growing miniature H. 'Sieboldiana' with a chartreuse edged, cupped, round green leaf. #5 'Ruby Benedict' - A low, spreading, very gold leaf with a green edge, and a very puckered, round leaf. #6 'Bashful Polly' - A wavy edged, splashed leaf. - 'Betsy King' - Strange that this does not sell well. It has magnificent purple flowers. - Good breeding plants - 'Beatrice' (gives variegated seedlings) and 'Holly's Honey', a wonderful "improved Ventricosa" form. - 'Royal Lady' - Not so royal and not outstanding. - 'Silver Streak' - Too slow to be important. - 'Sunlight' - A classic because it was the first golden H. 'Sieboldiana'. - 'Silver Tips' - Silver tips on lavender flowers. - 'Fantasy' and 'Hannah Hanson' were originated by Ernie Brodeur before 1969. I know nothing of these plants. - 'RosHogh' is from Curtis in the 1960s. I do not have it; do not think it important. Warren I. Pollock in The Hosta Journal (1997 Vol. 28 No. 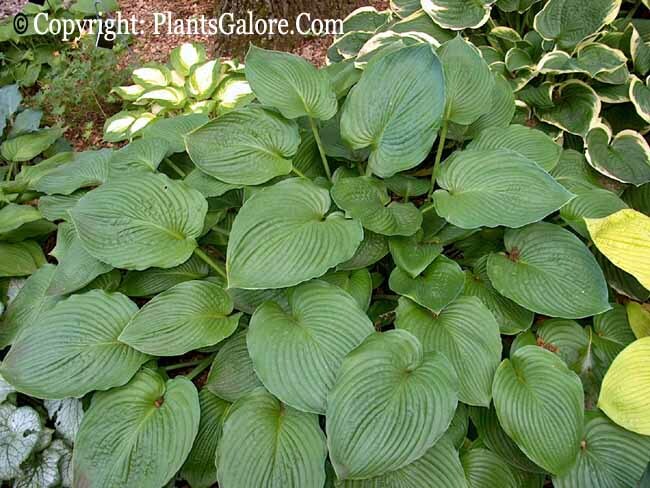 1) states that, "There already is a blue hosta with the leaf curling character of 'Stetson'. It is a seedling of H. 'Sieboldiana' (not H. 'Elegans' ) with pollen parent unknown. The leaf blades are canoe shaped, even more curled on the sides than 'Stetson'. Its very fitting name is 'Blue Canoe'...an exciting new introduction of Gwen Black who gardens in...England." An article by Warren I. Pollock in The Hosta Journal (2001 Vol. 32 No. 2) states that, "H. 'Prince of Wales' is a brand-new cultivar, a large blue-leaved H. 'Sieboldiana' seedling...It should be available in Britain in 2002." Bill Meyer in The Hosta Journal (2003 Vol. 34 No. 1) states that, "H. 'Sieboldiana'...is virtually the opposite of H. sieboldii, they both add large leaves, rounded leaf shapes, rugosity and heavy substance. They are also the origin of the wax that makes green hostas appear blue and of lutescent yellow coloring (all other species produce viridescent yellow seedlings). Like H. sieboldii, they yield large quantities of seed...Slow growth and poor division formation are at the top of the list of negative traits. In addition, they flower early, at a time when few other species bloom, often adapt poorly to hotter climates, go dormant in the summer and lack new leaf production during the second half of the season. Some would consider them overused." Warren I. Pollock in The Hosta Journal (2009 Vol. 40 No. 1) quoted Steve Chamberlain on his introduction, H. 'Academy Brobdingnagian Viridity', "...it's the largest green hosta from my original cross of (H. 'Sieboldiana' × H. montana ) and (H. montana × H. 'Sieboldiana'). I've registered only three out of more than 1,000 seedlings I grew to 8-year maturity: H. 'David F. Mahoney' registered in 2002, 'Academy Blue Titan' in 1999 and now 'Academy Brobdingnagian Viridity'...is a silly way of saying "Big Green"...Brobdingnagian is from Jonathon Swift's Gulliver's Travels." An article by W. George Schmid in The Hosta Journal (2009 Vol. 40 No. 3) states that, "Over the last 40 years I have learned that any plant with H. 'Sieboldiana' or 'Tokudama' in its background cannot stand drought." A Photo Essay article by Steve Chamberlain in The Hosta Journal (2010 Vol. 41 No. 1) makes comments about H. 'Jack of Diamonds', "Robert Savory registered this H. 'Sieboldiana' hybrid in 1985. Although smaller in both leaf size and ultimate clump size than 'Frances Williams', it shows all the desirable qualities of this famous cultivar."